Picture a group of the dead passing down the street next to your house. They sing out deathly stories and spread a creepy energy that makes you feel your skin crawl. You want to escape, but you can’t because their songs are also hypnotizing. They are terrifying, but you are curious to see what will happen next. When they pass by your house, you are not sure if they see you or not, but you wish you could disappear in case they do. The Santa Compaña walks before you to announce the death of a new soul that will join their procession. They are welcoming another spirit to their group. They are driven by a curse which can only be lifted by a powerful witch, or fate. 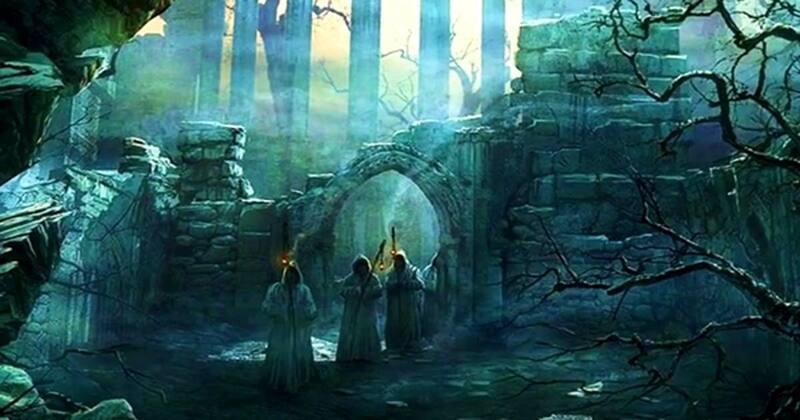 This mysterious procession of souls has been passing through the villages and towns of northwest Iberia and spreading fear for many centuries. They are led by a living person and together they create the scariest manifestation of the dead and living that you could ever imagine. There is a deep-rooted belief that is widely spoken of in the northwest of Iberia (Northern Portugal, Galicia, and Asturias.) Each one of the regions describes it a little bit differently, however, the darkness of the story blended the common mentality of the Portuguese and Spaniards and created a juicy story of the Holy Company of death. This story has provided many generations with sleepless nights and even caused insomnia in those who were skeptical of their ghostly existence. The world of spirits seems to be more connected to the living in northwest Iberia than it is in many other parts of Europe. The Santa Compaña is such an old legend that no one can even remember when it began. It has been written with so many different variations that it is also difficult to discover which region is the homeland to this bizarre procession of the dead. The origins of the legend remain unknown; however, it reminds one somewhat of the famous Odin's Wild Hunt. Specialists in Celtic mythology also suggest links to the Breton processions of the dead, who apparently traveled to the end of the world. A third link is made with Wales and the story of the Hounds of Annwn. The Celtic appearance in Spain and Portugal is well known, so the links among the mythologies of different Celtic regions is logical. The mixture of local beliefs with stories brought to these lands by invaders and immigrants created unique legends and traditions. Some elements of the Santa Compaña seem to be related to the Breton Ankou and the Irish stories about Banshees too. Similar legends can be found in many other parts of the world. Most people have never seen Santa Compaña, but many have claimed to experience a creepy feeling of their presence. According to legends, this procession of ghosts is formed in two rows. They walk wrapped in shrouds and are barefoot. The spirits are said to hold candles in their hands, so when Santa Compaña walks past households people can smell burning wax. Some other witnesses claim to hear prayers or funerary songs. Small bells accompany the ghostly melodies. Legends say that the procession of dead passes through villages, empty roads, near households and into the fields, led by a living person who is sometimes dressed in a white hooded cloak. According to some stories, the spirits are also dressed in hooded cloaks. Sometimes the procession isn’t said to be led by a living person and it only involves the dead. The leader usually is thought to belong to the church – for example he or she is a parishioner of the church in the parish where the procession is going. Three major symbols related to death rituals always appear in the stories: a cross, candle, and holy water. Santa Compaña apparently comes to punish people for their wrongdoings in life. They are seen as a curse. They are said to always appear around midnight and disappear before the first rays of the sun. Although there are many different versions of the legend and even the names are not the same in different regions, all the stories include a group of souls in torment walking down the streets. Names like Estadea, Rolda, Patalla, Avisons, Pantaruxada and As da nuite remain famous in local stories related to these supernatural events. In some texts, the leader of the procession is known as Estadea. To avoid a meeting with the Santa Compaña, a person must find a way to protect him/herself. A very well-known method is drawing the Circle of Solomon with chalk or salt. A back cat passing the road where they are walking also breaks their plans. A belief in the supernatural, ghosts and other beings remains strong in Asturias, Galicia, and Northern Portugal. If you visit these areas, you will soon realize how many of these kinds of old stories are still alive. It remenbers me also the wild hunt, or Grande chasse, Mesnie Hellequin in french. A supernatural procession (but of hunters here) that take souls to hell. Probably celtic, as in Galicia.